It’s a gorgeous day here in Southeast Kansas, so we started the day with a short walk. Then, I perused the yard to see what needs done – it’s spring, so there’s always a lot to do. Tommy the Neighborhood Cat joined me in admiring the overgrown pretty “weeds” in the yard and how even the grapevine buds looks like flowers. 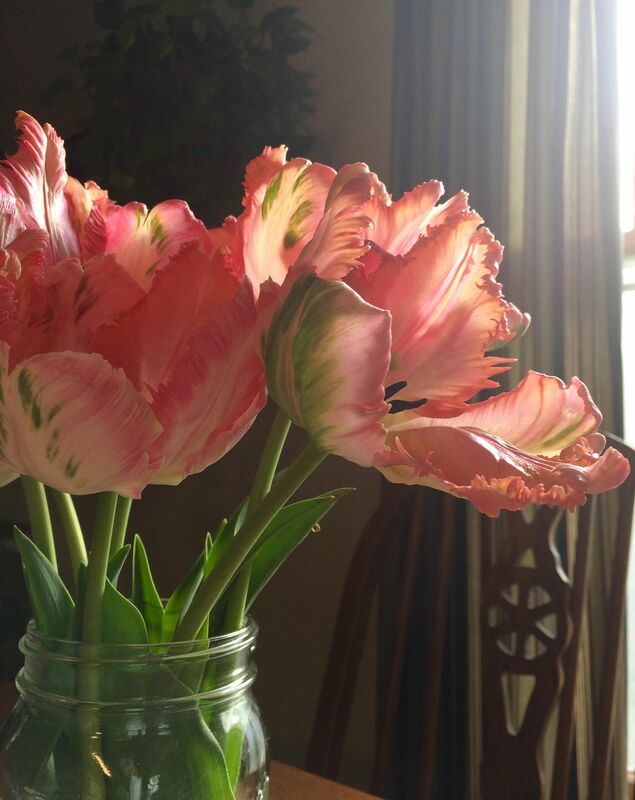 As it is Beltaine Eve, I hope you all find some beauty in your world too. Today’s card comes from one of several Arthurian-inspired decks, and it could prove beneficial for many I know who are in flux or indecision. Trust your instincts and know the universe will help you. Blessings! Meaning: Liberation. The attainment of a long-sought goal. The culmination of events, efforts, and experiences from the past. Completing a task with honors. Trumps and prosperity. Winning the admiration of others. Attainment bringing change that still retains stability. Security and assurance. Synthesis bring a sense of peace and wholeness. May refer to travel, a new home, or graduation. The ability to direct one’s life. Confidence, success, and lasting happiness. The card could also indicate regret, lingering doubts inserting with decision making. Delays; lack of support. Losing interest or enthusiasm after beginning a new project. Failing to follow through on plans. Loss of direction; scattered energies. 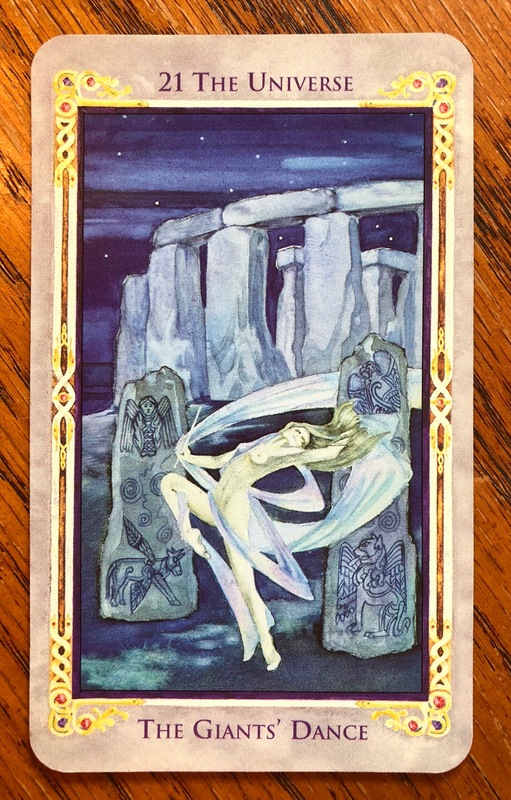 Description and Symbolism: Under the heavens and amidst the stones, the dancer celebrates life in her victory dance of being. This ecstasy comes from deep within, when the conscious and subconscious work in unison. This leads to encounters, however brief, with the superconscious and its lasting gifts of faith. This synthesis opens many doors to understanding. The woman’s dance represents embracing and enjoying life, living it to its utmost. Her iridescent veil drapes about her but does not restrict her movement, representing a flexible lifestyle and environment. She is the perfectly natural, unencumbered self, free to dance in rhythm with the universe. The wand held in her hand symbolizes that she is the mistress of her own fate, not living by the dictates of others. She carries the wand with ease, representing self-confide ice and faith; there is no desperate battle for control. As the woman dances, she travels the ditch that surrounds the stones. It has been theorized that rituals at these sacred sites involved the king, chief, or druid walking a protective circle, a Path of Blessing. This was thought to harmonize the four energies of the earth, the quaternary powers depicted on the foreground stones. 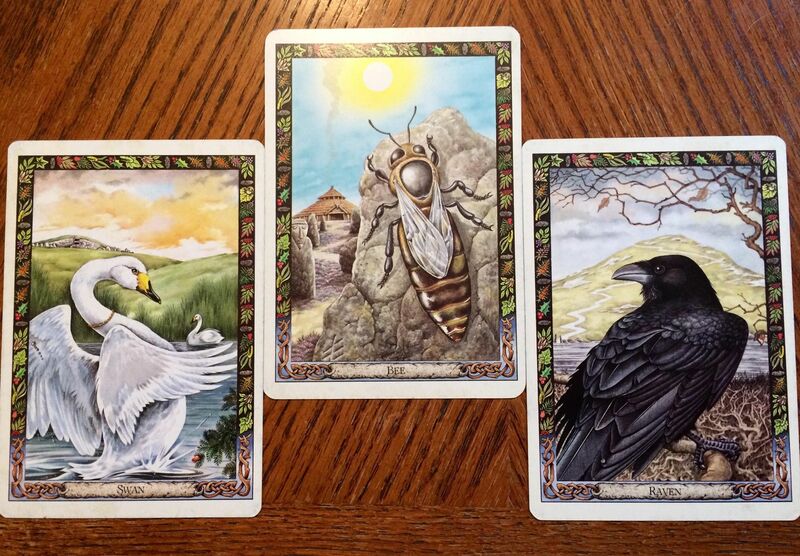 These are the four evangelists traditional to the card, symboling the culmination and balance of energies. These figures correspond to the zodiac as: the man/Aquarius, air; the bull/Taurus, earth; the lion/Leo, fire; and the eagle/Scorpio, water. 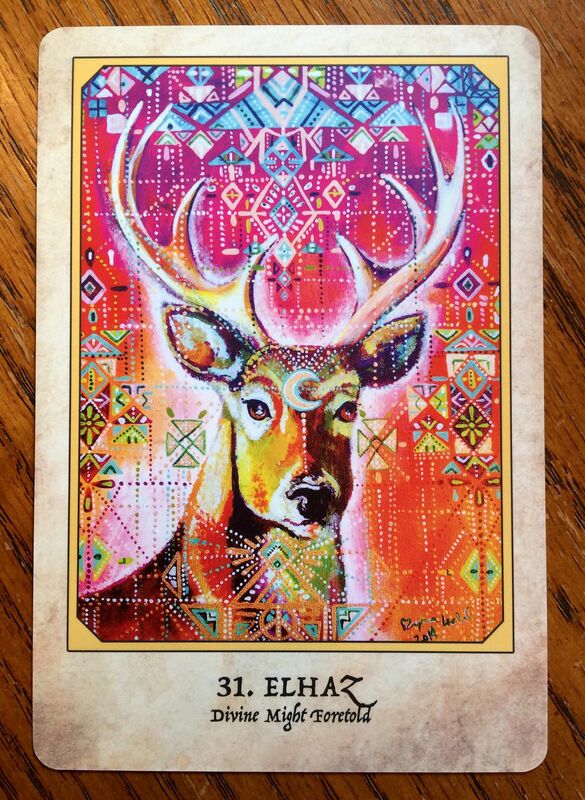 The qualities they bring to the card are, respectively: intelligence and independence, determination and stability, strength and enthusiasm, and intuitive knowledge and great spiritual heights. The evangelists in the painting are as they appear in the famous Book of Kells. The church associates the man with Matthew, incarnation; the bull with Luke, passion; the lion with Mark, resurrection; the eagle with John, ascension. Taking time to rest the body, mind, and spirit was an important thing for me to learn. As a Taurus, I can sometimes push myself too hard and burn out. Then comes the power of inertia, which is hard to push myself out of. By resting and caring for ourselves as we go, we get more done in the long run. Don’t forget that play can be a form of rest. Doing something not because you have to or feel that you should, but because it’s just the whim of your soul, can restore a lot of energy and creativity. Blessings! Your energy is a precious resource, and there are ways of being that can enhance it, amplifying it, and replenishing it. Give yourself sufficient rest, and you shall find the way forward more effortless. Explore the lifestyle that grows your inner resources, rather than requiring constant exertion and exhaustion to accomplish an endless list of external pursuits. You need this shift in being now because you are ready to accomplish more. For this to take place, there needs to be less effort and more wisdom. Trust and value what can be accomplished through rest. Meaning: You have more than enough energy to bring to life the sacred visions held within your heart. An increase of energy and peacefulness is indicated. You are guided to choose high energy people, places, and purposes. This does not necessarily mean choosing that which is highly stimulating – rather, it refers to that which regenerates you with peacefulness and joy. Give generously to yourself to be able to give generously to others. You have unusual ideas or ways of being that suit you, but may not suit others. Work with what works best for you, without trying to force yourself to conform. This brings wellbeing and creative success. 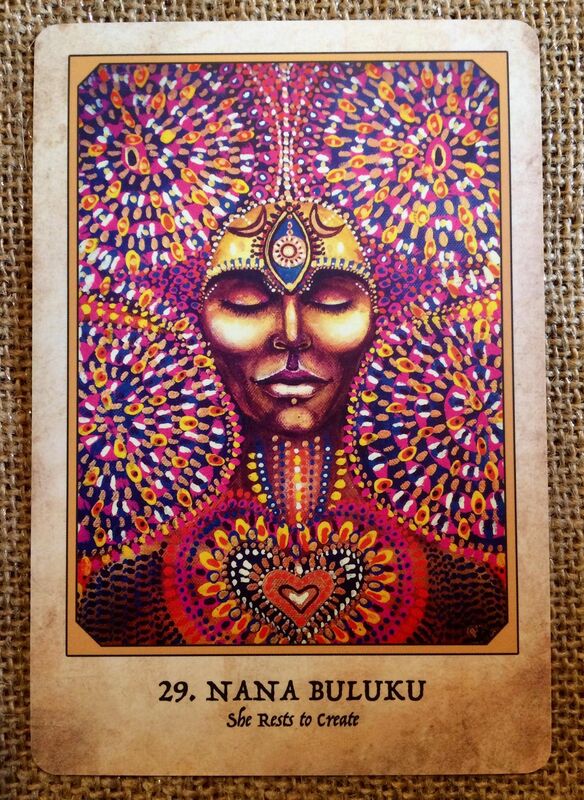 Guidance: Nana Buluku is the African Grandmother Creatrix, the supreme feminine creative principle. She created the Universe, then rested. The intersection of rest and extraordinary creative power is repeated in numerous spiritual traditions from varied cultures around the world. It is also repeated in the lives of inspirational innovators in varied fields of discipline from the sciences to the arts. When you are boldly ambitious and creatively confident for the fulfillment your life purpose and heart-inspired plans, it may seem that rest is the last thing you have time for, there is so much to be accomplished. Yet the conscious use of deep rest allows us to connect closely to the divine creative genius. Taking time for rest and stillness can allow us to work smarter rather than just always working harder. African spirituality is based on a holistic worldview where no issue in one’s life is separate from the spiritual worlds. This recognition that the Divine is intimately involved and lovingly invested in every single aspect of your life is how you begin to generate restful consciousness. This type of consciousness is based on trust that the Divine knows what you are here to do and wants to help you do it. Therefore, you don’t have to orchestrate the details of you life, nor figure out everything (or anything) on your own. You do not need to have signs to prove something is happening every single day. What you need is faith in the fundamental good will that the Divine has toward you and your life purpose, the reason for which you chose life in the first place. From that place of restful consciousness, you can make profound progress. You can release striving and pursuits in favor of activity that comes from a place of inner inspiration, born from rest. In the mystical traditions of many cultures, that period of rest is considered to be the time when we incubate in silence and spaciousness. Through the invisible workings of the most willing and loving Great Spirit, all quiet and openness is responded to with renewed energy, clearer direction, and helpful guidance. You will likely find yourself becoming more active, and certainly more productive, through this process of resting regularly as part of your lifestyle. Rather than constantly discarding energy without having time to adequately restore yourself, instead, you will be having time to adequately restore yourself, instead, you will be regenerating more swiftly and deeply on all levels of your being and continually amplifying your energetic output. Your actions will have further reach. You’ll have more to share with your loved ones. This is sacred subversion of established disorder that would help you get to where you want to be, to make the contribution that you want to make. Instead, you will be healing and growing and creating from a place of trust within, creating the new world order in harmony with divine genius. I’m feeling this card strongly today. Spent a few hours outside last night doing a late spring cleanup in the yard and planting herbs and some veggies. Awoke this morning to a light, cool rain giving it all a soft bath and making the green pop. It feels magical walking through a light rain – refreshing the soul as well as the senses – and seeing the colors and hearing the birds on a beautiful wet morning. Hope you all have a great start too! 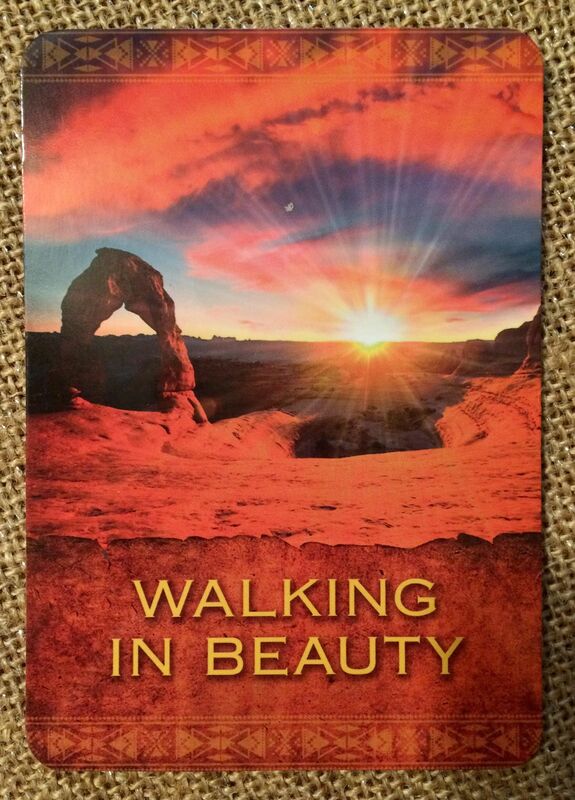 Native Spirit Wisdom: In Native American traditions, there’s the concept of walking in beauty. It’s called “hozho naasha” in the Navajo/Dinch tradition, and it means being in balance with a natural way of life. When we are in the right relationship with the natural world around us, we are walking in beauty. The more you sense and see beauty around you – in your environment, yourself, and your body – the more it will fill your life in all forms. Never say anything about yourself or your body that’s negative. Don’t put down yourself or others. Instead, affirm beauty, and take time to adorn your body and personal space. Walk in nature and inhale the beauty of eery part of our wonderful planet. Cherish yourself and the luminescence within you, and you will glow. Courage comes in many forms: from heading into literal battle to having an uncomfortable conversation. Perhaps today is the day to have more courage to tackle an issue that’s been on your mind or heart. Blessings! 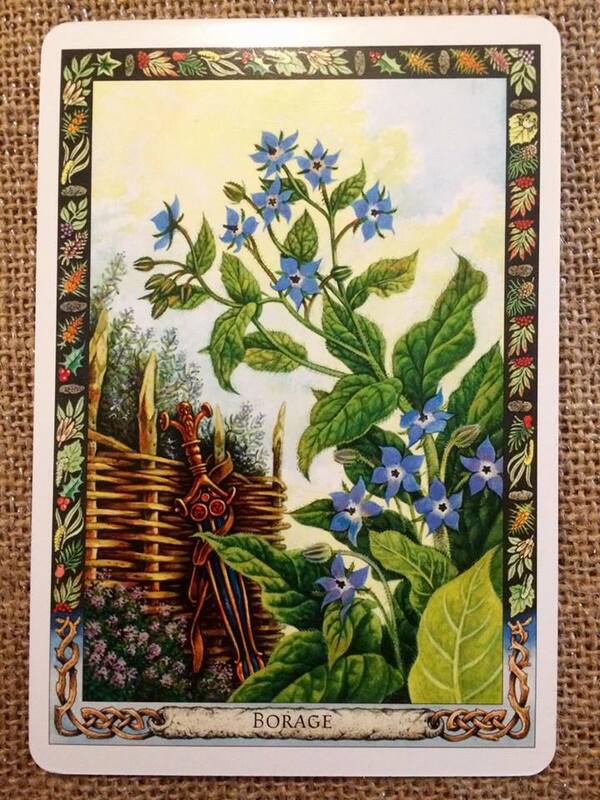 Meaning: Borage (Borrach) has been associated with courage since ancient days. If you have chosen this card it may be that this is the quality you need to draw upon at this time. True courage requires a strong and generous heart, and this involves looking beyond your own needs to perceive the greater good of those around you. This may mean you need to be courageous in standing up for someone who is weaker than you or who needs your protection, or it may mean sticking your head above the parapet to make a stand for what you believe is right. To be courageous and daring, you must also be able to forget. If you hold every eventuality in mind, you will never act, and being courageous often require a magnanimity that forgets personal slights or errors in judgement. Going beyond judgement or recrimination, true courage is a brave open-heartedness that restores our confidence in human nature, bringing with it joy and happiness. Well, it’s Monday again, but at least we have the Bee with us to encourage us to get over it and celebrate and gather with community in whatever way we define it. Have a great one! 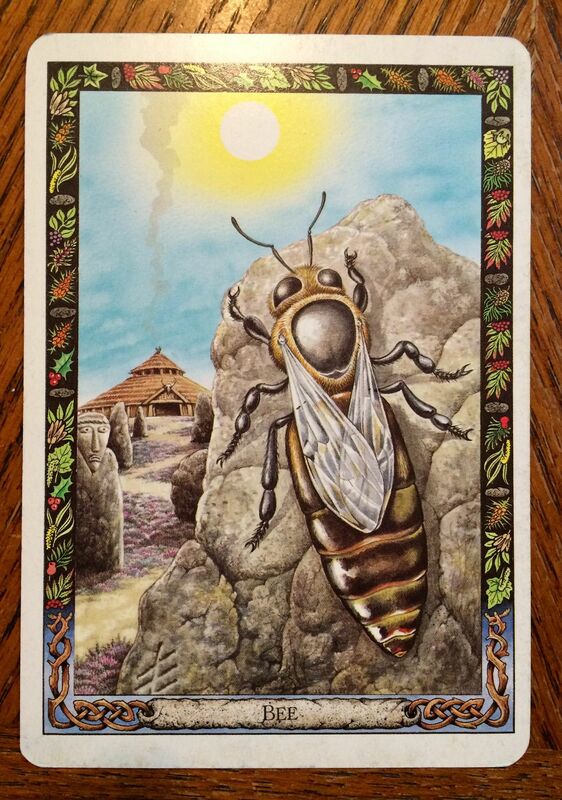 The card shows a queen bee resting on a stone. In the background we see the House of Mead Circling at Tara as it may have looked at the height of its powers. In the sky, the noonday sun shines brightly and we see Ur, heather, growing by the rock that is carved with the Ur Ogham. Meaning: Beach invites us to celebrate. You may have special reason for celebration, or you may simply need to celebrate the wonder of being alive. You may like to enjoy a glass or two of mead, which – if it has been made in Scotland – will carry the scent of heather, and will bring you closer to the spirit of the highlands. In the Druid tradition there are occasions to celebrate every six weeks or so. As human beings we need to have times when we can come together to enjoy each other’s company. The bee tells us that we can live together in harmony, however, impossible as this may sometimes seem. By being at one with the natural world, by paying homage to the sun, by centering our lives around Spirit or the Goddess, we can work together in community. 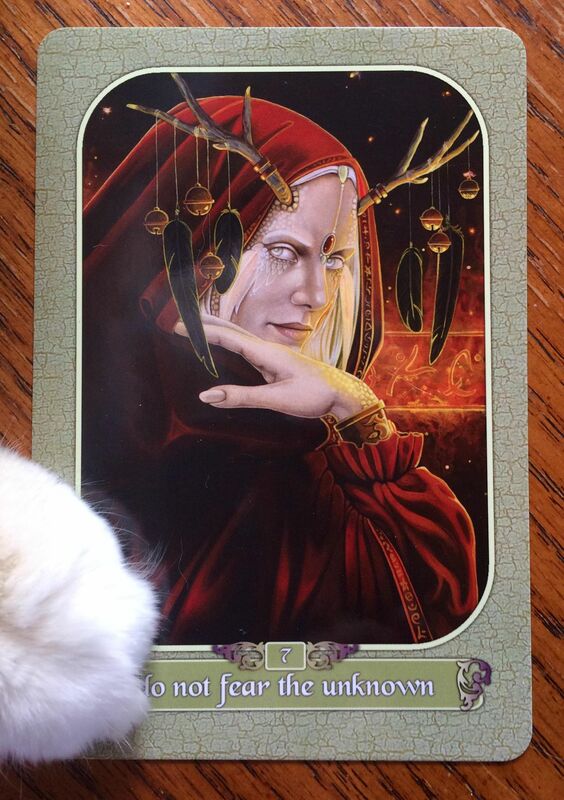 The card may also indicate that you are feeling out of place – unsure of your role in the world. A beehive functions harmoniously because each bee knows its role and the work it must do – consequently it is highly productive and plays an important role in the local ecology. We talk of a productive work environment as a hive of activity. If you find you are lacking in motivation or are feeling isolated from the community that surrounds you, you may need some bee medicine. A modern English folk healer uses bee stings therapeutically to cure asthma and other ailments, and you may need to prod yourself into action before others do the prodding for you. If you find this applies to you, spend some time thinking about your role in life, and then make decisions in accordance with your sense of purpose and the resulting goals that this engenders. Remember that the bee knows the value of organization, of paying homage to the Goddess and the sun, and of working hard. Remember too that she call us to a celebration of life and an inner recognition of our membership of the community of all Nature. Card of the Day: Elhaz – Divine Might Fortold! 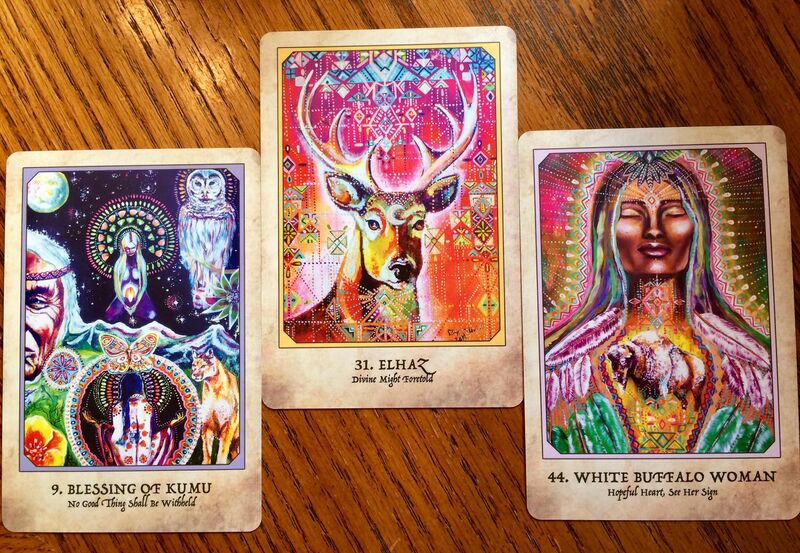 The Whole Spread, including Blessings of Kuma and White Buffalo Woman!